This is the third stage of the King’s Cross to Birmingham jaunt via the Grand Union Canal. I took the tube to Greenford, stopped off to buy a bag of bombay mix and hit the trail just before 1pm. The first half of the walk took me deep into the west London suburbs of Southall, Hayes and Hillingdon. Once again, light industry alternated with suburbia, factory workers took quick fag breaks, mums pushed buggies. I passed mosques, motorways, moorhens and much litter, jets thundered by on their way to Heathrow. A colony of swans forced me off the towpath, they are big beasts once out of the water and best given a wide berth. In places the towpath was heavily churned up by cyclists, careful attention was needed to avoid muddy shoes. After a couple of hours I reached the half-way mark, Bulls Bridge junction. To my left (south) the canal became the ‘Brentford Arm’ which eventually empties out into the Thames. To my right, the path to Brum. I was sorely tempted to take the Brentford turn but that will have to wait another day. I sat down on the grassy embankment and had lunch. I walked by the Nestle factory; it gave out a strong, though not particularly pleasant, aroma of cocoa and chocolate, I passed men walking dogs, a dealer selling drugs in the shadow of a bridge, graffiti, a homeless person camped under the railway. I played catch-up for a while with a grey heron until it became tired of the game and flew off, I love how herons manage to look ungainly and graceful at the same time. I passed moored narrowboats, some of which had wood-burners on the go, giving out an utterly delicious smell. I waved at narrowboats heading south and was given waves and smiles in return. 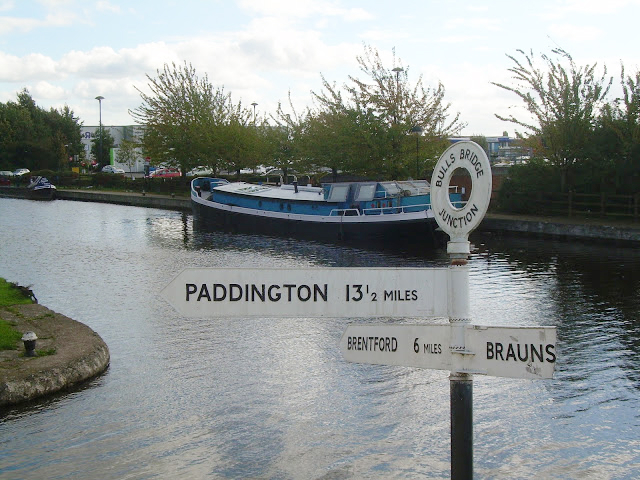 I passed a mileage marker, only another 87 miles to Braunston, wherever that might be. Just after the mileage marker I was stopped by a cyclist heading south. She asked me how far it was to Bulls Bridge. I noticed the maps and panniers strapped to the back of her bike, a fellow adventurer! She was from Germany, and was in the UK to attend a conference in Leicester. After the conference, rather than return to London by train, she had decided to cycle back along the towpath, stopping the night at B&Bs along the way. What a great idea! We chatted for a while before she started off again, hoping to find a place to stay in Paddington. I found a grassy spot for a rest and finished of the tea in my flask. For a while I lay on my back under a tree and watched birds skipping to and throw among the low-hanging branches. The late afternoon sun felt good on my face and I dozed for ten minutes or so. One of the great things about walking in the autumn is foraging for free food, i.e. blackberries. I found an abundance of this lovely fruit on the towpath, just hanging there ready for picking. Free food! It really can’t be beaten. By 4pm I reached Cowely and the first lock since central London, only 130 or so more to go! Also at Cowley Lock is the excellent, grade 1 listed, Malt Shovel pub where I enjoyed a fine pint of Doombar. After that it was short walk to Uxbridge and the tube back to King’s Cross. Would you believe it, I’m actually walking the Grand Union too — but in the other direction. I’ve done Birmingham to Weedon in Northamptonshire. It’s turning into more of a lifetime project, however, as I haven’t covered a stretch in years. I just love canals, as there’s always something of interest — though I haven’t yet met any female German cyclists. Doombar is a very fine pint — remember drinking a fair amount of it when walking the Cornish Coast Path! I’ll look forward to meeting you on the way to Birmingham then! Enjoyed this blog. Made me feel quite envious and wish my legs were in better condition for long walks. You’re certainly getting a fine view of English byways and enjoyed the descriptions of the various terrains and birds. Look forward to the next instalment. Im looking at hitch hiking a canal tow path in Oxfordshire. Anyone got any experience in doing this on a canal tow path and getting barges to stop for you? Hi Mike, I’ve often though of hitching a ride on a barge, you should give it a go, you might strike lucky! Which tow path are you planning to hitch? Im walking the Oxford to Banbury route over 2 days so I thought I might try hitching..! I’ve emailed the canall and river trust to see what the legality of hitching on a canal is but so far they havent replied. The walk is the 16/17th June so fingers crossed for good weather. !